Rich in nutrients and flavor, a must for every vegan or vegetarian soup! Place all of the ingredients together in a large pot. Reduce heat and allow to simmer for 45 minutes or until all vegetables are soft, stirring occasionally. Strain soup through a fine strainer. Allow stock to cool for 1 hour at room temperature. 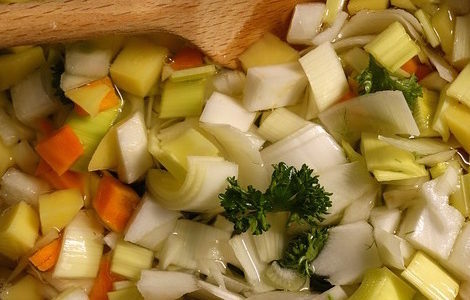 Use for soup stock immediately as a soup base or refrigerate and use throughout the week for other dishes. Get my BEST Articles! Join our mailing list ?to receive our latest information about health and wellness delivered to your inbox! It’s FREE!! Or visit the Guerrilla Diet Website for more health advice and information HERE.